Hey Folks! Jacqueline Fernandez and Sushant Singh Rajput's forthcoming film Drive finally got a release date and the Internet can't keep calm. Minutes after the makers of Drive shared the film's teaser on social media, the film occupied a spot on Twitter's trend list. On Thursday, the makers of the film shared a first glimpse of the film in the form of a teaser video along with the announcement of the film's release date. The film is scheduled to release on June 28, 2019. Drive has collaboratively been produced by Karan Johar's Dharma Productions, Apoorva Mehta and Fox Star Studios. The 23-second video comprises silhouettes of cars and the names of the film's director and producers flashing on the screen. However, it is the intense music and the sounds of screeching tires that adds definition to the teaser. Drive has been written and directed by Tarun Mansukhani. 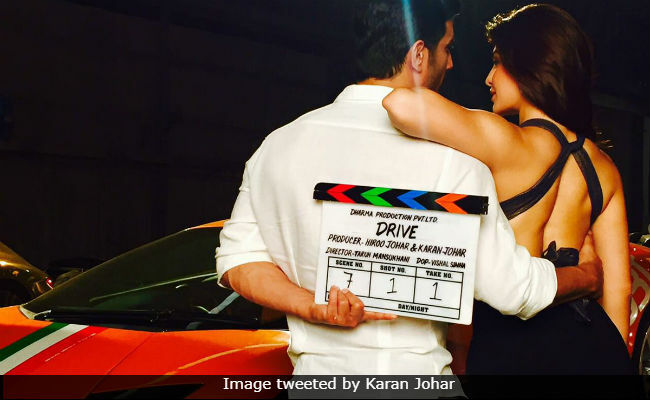 Drive's lead actress Jacqueline Fernandez shared the film's teaser on her Twitter account on Thursday. She accompanied the video along with the caption that read: "On your marks, get set and race! See you in cinemas for a pulsating ride on 28th June, 2019." Meanwhile, Dharma Productions shared the film's teaser along with the captions: "Buckle up, Drive hits theaters on 28th June, 2019." Karan Johar, who is one of the co-producers of the film, announced his association with the project by sharing the film's poster and tweeted: "Start.. Zoom... Accelerate... Drive on the 2nd of March 2018 with Sushant Singh Rajput and Jacqueline Fernandez. Directed by our Dostana boy Tarun Mansukhani." Drive went on floors in March 2018. Karan Johar shared this poster of the film and wrote: 'The franchise fun begins....Drive starts today! The first of the series!" Sushant Singh Rajput, who plays the lead role in Drive, in an interview with news agency IANS earlier this year said, "It's a heist film. When you are going to watch the film, you would not know what is going to happen next."